"Master, let me see again." All of Jesus miracles can be read in many different ways: there is always a message  almost a parable  behind each one, that tells us something about God, about his care for his people, about Jesus and about the promises God has made to us, his children. 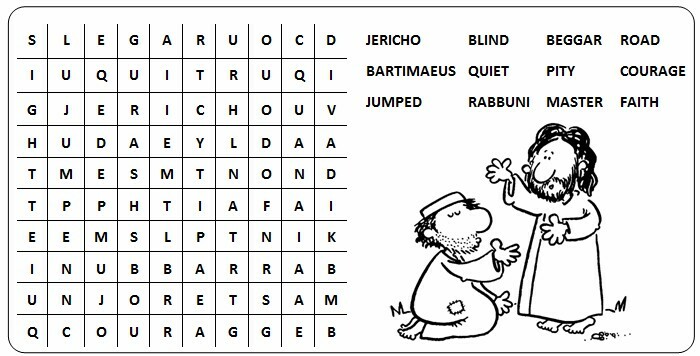 Today is no excep­tion: on the simplest level, we see Jesus offering the greatest gift he could give to Bartimaeus ‑ the gift of sight. It shows us Jesus love and care for those who suffer. But that alone is not the whole meaning of this story, as the first reading makes clear: there, through Jeremiah, God promises to gather his children into a new and perfect Kingdom, washing away the tears and restoring comfort. So Jesus appears as a fulfilment of this prophecy, as the One who brings this Kingdom into the world. But it doesnt end there: in our own age we still have the blind, and those who suffer: there are still tears to be washed away  Jesus work is begun, but not completed. Gods promises extend to us as well. As followers of Jesus, we should imitate him in doing what we can to bring that comfort which is the Kingdom of God to all in need. To understand the tone of this read­ing, look at the first three words: Shout for joy...! It would be a grave disservice to this reading to proclaim it in a flat and formal way ‑ just look at line three and try different ways of reading the words Proclaim! Praise! Shout! One of the problems in reading in Church on a Sunday is that quite often, when people settle down for the readings they are not fully responsive to them. As a reader, your first words, and the manner in which you read them will either encourage the congregation to listen attentively, or to switch off altogether! Today, you have a great opportunity to wake up the congrega­tion: use it! Understand the marvellous picture God is painting through his prophets ‑ not an empty dream, but the final goal for all his people. Let there be warmth and enthusiasm m your voice, as you unfold to todays congregation these promises of comfort and joy. This reading can seem slightly ob­scure: it is about Jesus as our High Priest, and the author of the letter uses the old priest­hood of Israel to illustrate what he means: the key phrase is ...to act for men in their relations with God. Jesus achieves this per­fectly. Be careful with the first three words every high priest, as these give the context to a lot of what follows. Take the whole passage slowly and carefully, following the logic of the argument and explaining it steadily. Here, more than usual, slight pauses between sentences will help the ar­gument be understood. It might be useful to have another look at last Sundays second reading, which helps explain Christs priesthood.